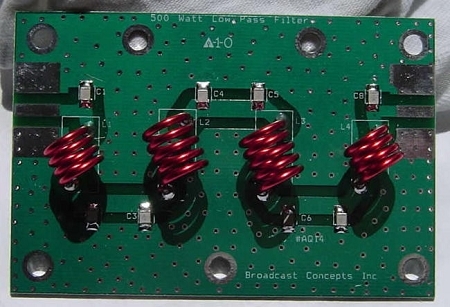 A high quality, high performance and competitively price low pass filter for all 50 ohm pallet amplifiers up to and including 150W continuous power. 0.30 dB insertion loss maximum; 0.25 dB typical. -25dB return loss maximum; -28dB typical. Size: 2.5 inches wide x 3.75 inches long x 0.625 inch tall. .25dB maximum insertion loss, better than -25 dB return loss from 88-108MHz. Mounts to customers chassis with 8-32 or 6-32 screws. PCB standoffs or washers are required between the bottom of the PCB and chassis to prevent shorting of the inductors. Installing the filter in a metal chassis is suggested to provide shielding and good thermal conductivity in high power installations.